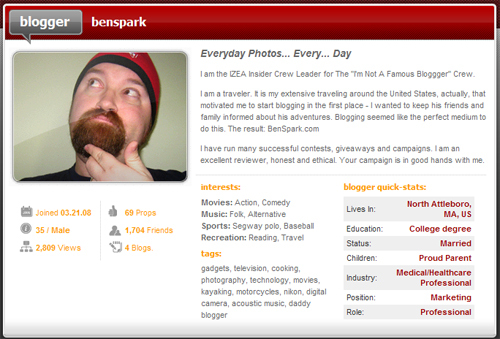 As an IZEA Insider I spend a lot of time looking at the SocialSpark profiles of bloggers. I’ve gone through about 10,000 of the 24,000+ profiles on the system. Do you know what drives me nuts? Anonymity. Look at this image. Can you tell one blogger from another? No. The whole point of SocialSpark is to connect bloggers with advertisers. Who do you think an Advertiser is going to choose for their campaign, a blogger with no information on their profile or a blogger who took the time to promote themselves. 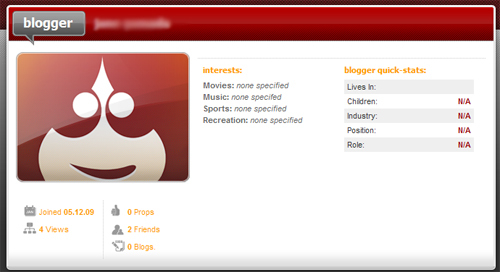 Your profile on SocialSpark is the first thing that an advertiser is going to see. Make it memorable. Who is going to get the opp? So how do you make your profile memorable? You edit your profile and add actual information. To access your profile follow this path. Okay, now you are in your profile. Time to fill out the essentials. Let’s start with question #1. Your display name. For the love of all that is holy and sacred in the world do not display a crappy name. You could put your actual name, your blog name or the name you are known for all over the web. Don’t display names like gmstr1, FuNkIeblger1 and stuff like that. Advertisers are going to look at those names and pass on you so fast. Put your best foot forward and give them a good display name. The next most important field is the Headline. This should be your blog elevator pitch in 125 characters. Boil down your blog or yourself to the essentials… who are you and what you blog about. Say it here, short and sweet. Then there is the About You section. Here you have 1150 characters to spell out exactly why you are the right blogger for advertisers to choose for opportunities. Showcase what you have to offer an advertiser and you will get noticed. The next tab is the Avatar tab. I will talk more about this in the next installment of SocialSpark Saturdays. Amen Ben! When I demo the site to advertisers and agencies nothing frustrates me more. Thanks for bring attention to this. Great tips! I thinks I’ve done ok on mine. Karens last blog post..The Eurovision is over for another year! 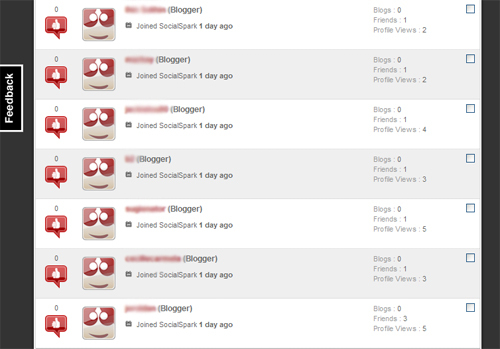 It is ridiculous how people don’t take the time to present themselves in a forum like SocialSpark. I hope that more people are helped by my weekly tips and we make SocialSpark the amazing place it should be, at full potential. I believe that yours is pretty up to date. No worries there. Thanks, I prefer the individuality of my photo as well.